Description: It is critical to minimize corrosion and deposits in the boiler systems in order to maximize energy efficiency and life span. The gases typically dissolved in water, such as oxygen and carbon dioxide, lead to corrosion. Oxygen causes pitting and rusting while carbon dioxide causes acid corrosion. 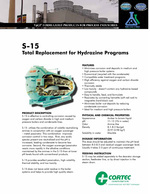 S-15 is effective in controlling corrosion caused by oxygen and carbon dioxide in high and medium pressure boilers and condensate lines. Package: 5 gallon (19 liter) containers, 55 gallon (208 liter) metal drums, liquid totes or bulk.